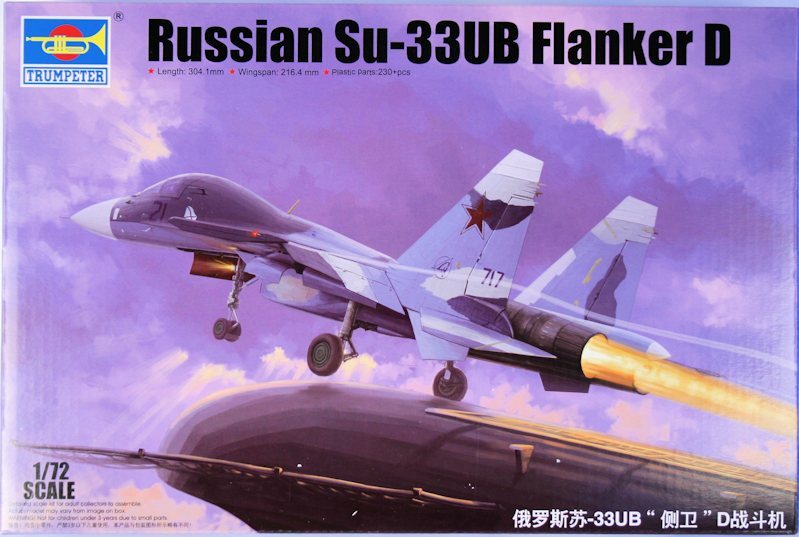 Trumpeter box art - Su-33UB launching from Kuznetsov's ski jump. 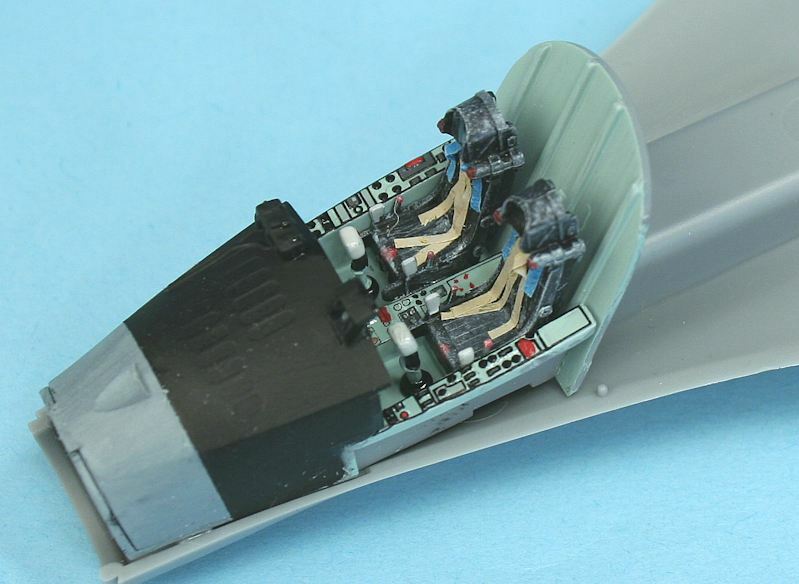 Top and bottom fuselage halves - straight mainwheel bays!!! 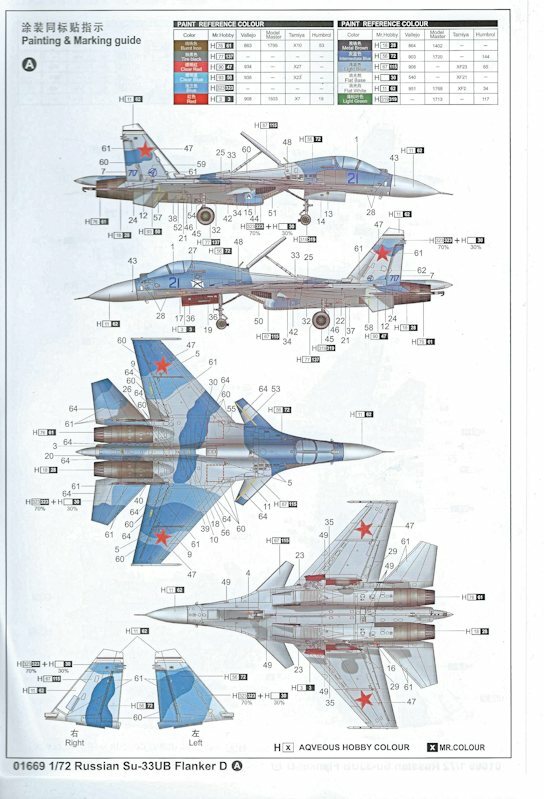 Alternate spread and folded wings. 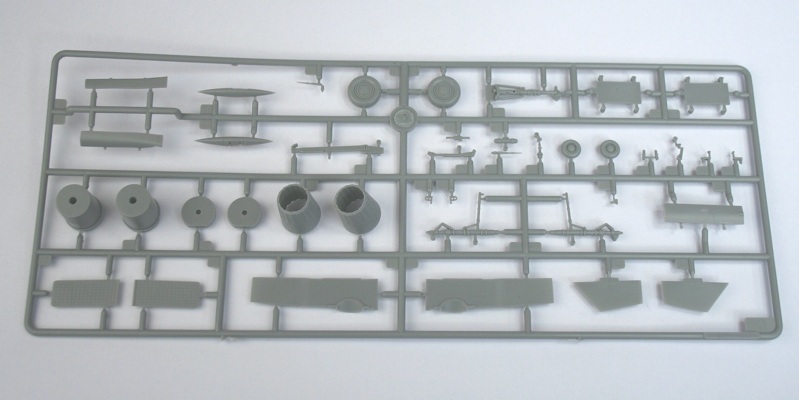 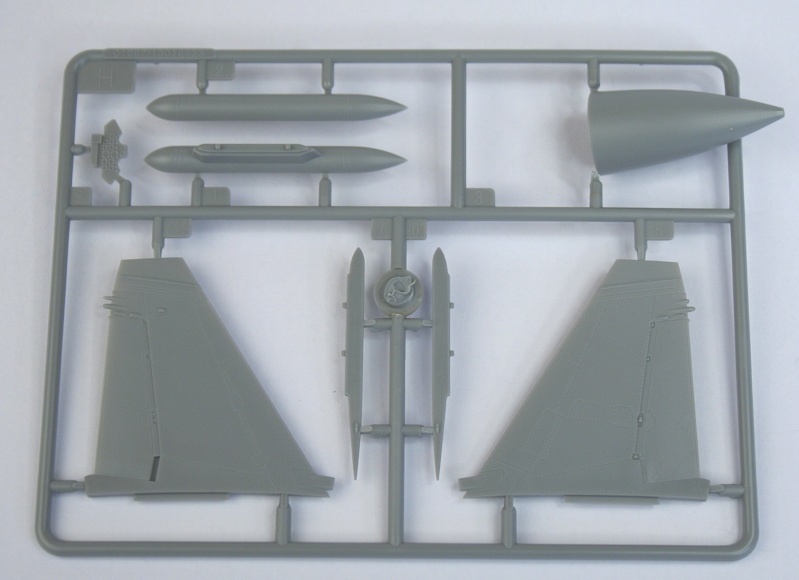 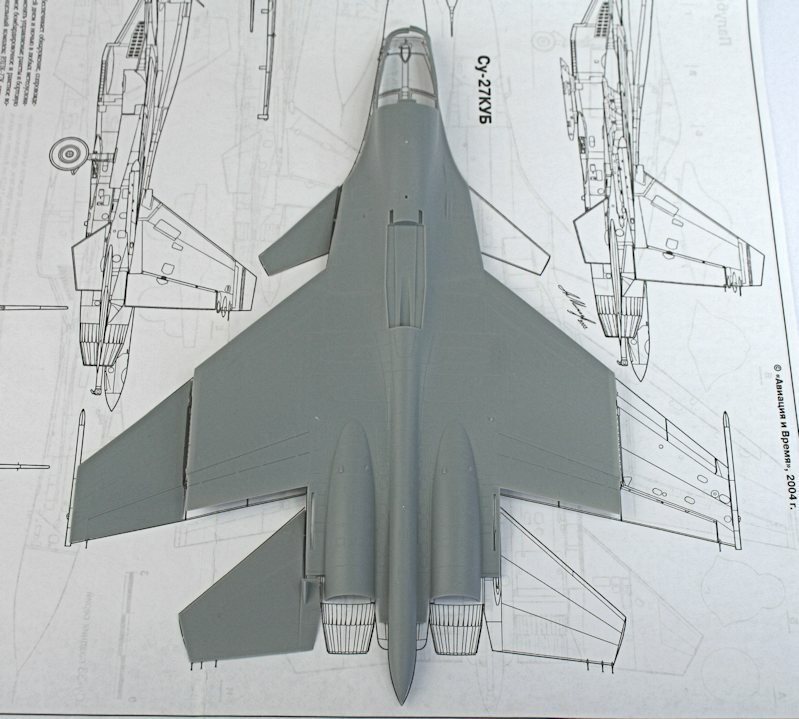 Sprue C2 - exactly the same as the Su-33 kit. 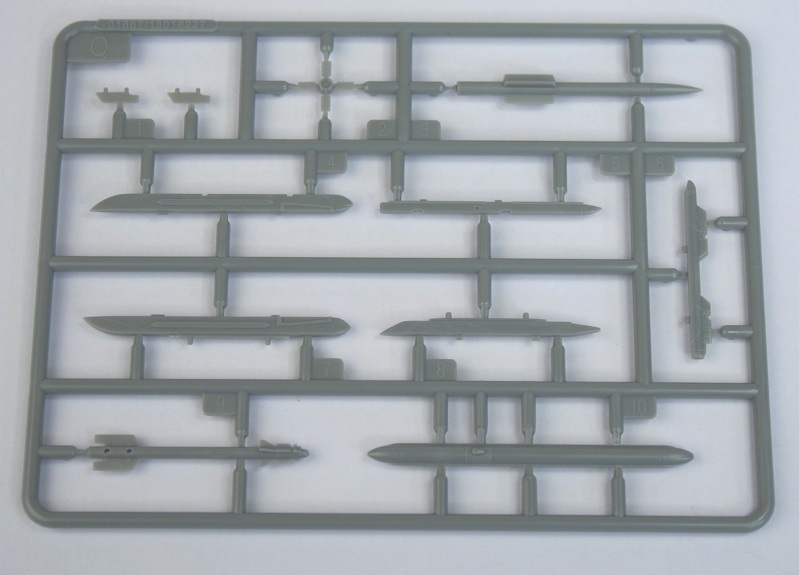 Sprue C - same as Su-33 kit. 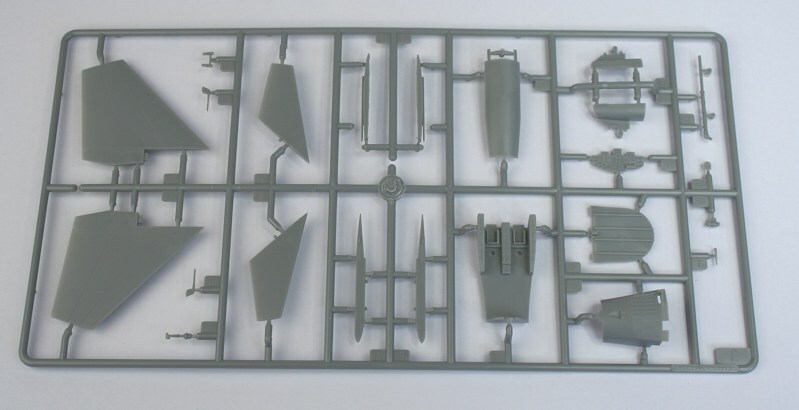 Sprue H - same as Su-33 kit. 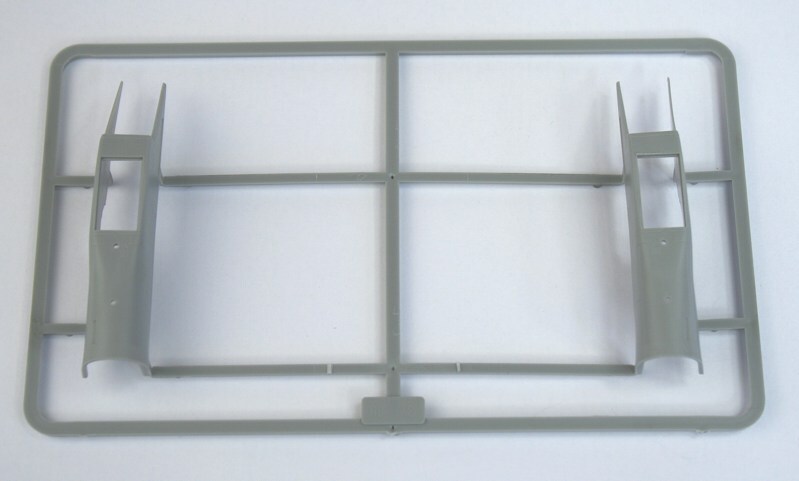 The rudders should have increased chord. 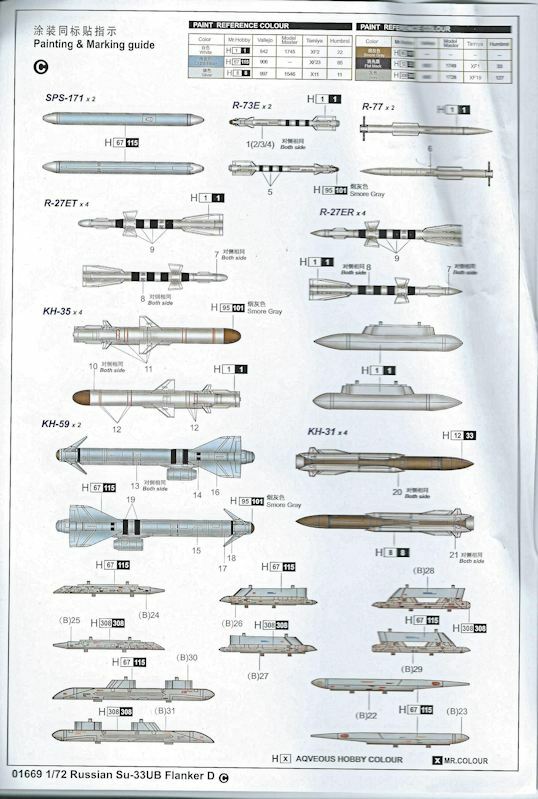 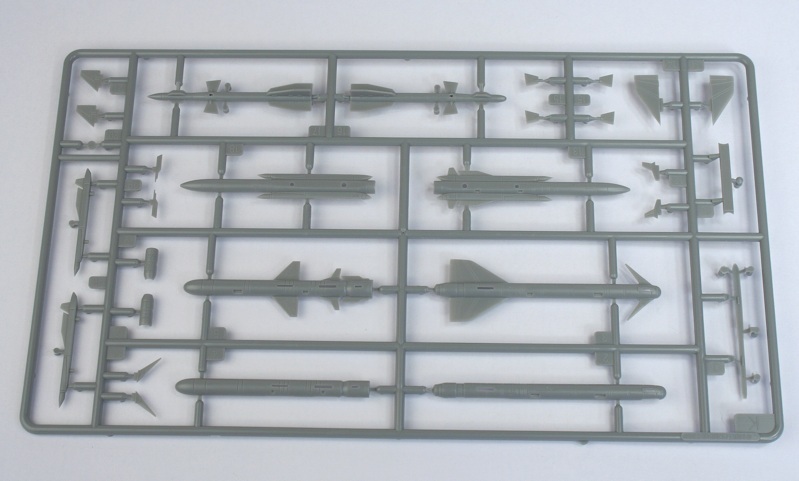 4 X Sprue K - same as Su-33 weapons. 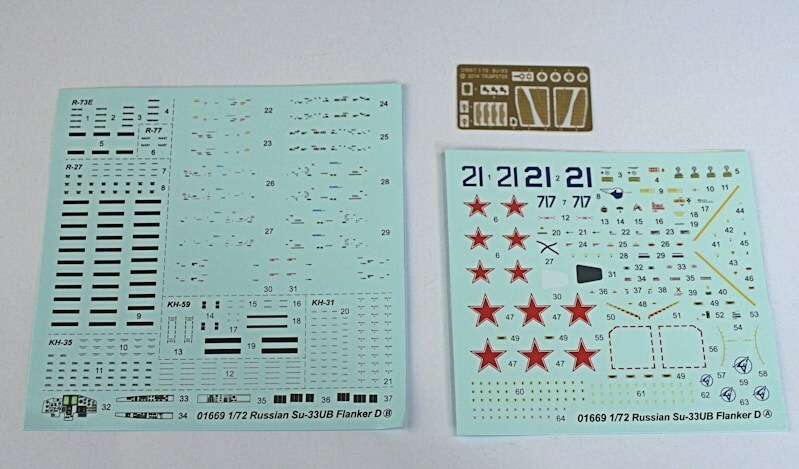 2 X Sprue Q - same as Su-33 kit. 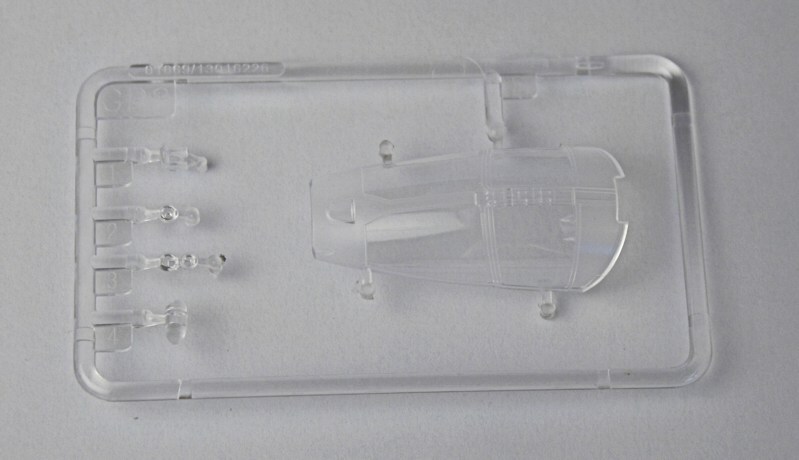 New clear sprue for canopy. 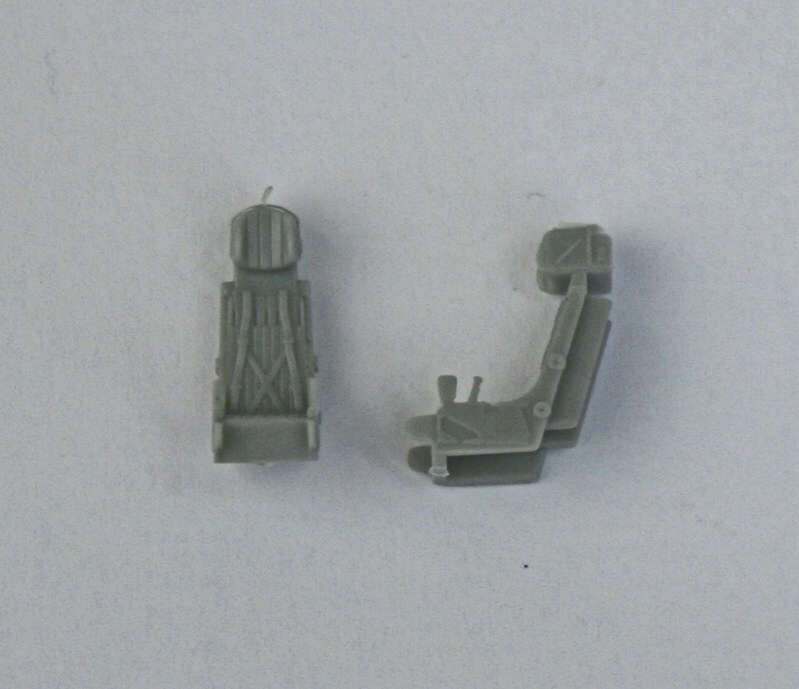 Two K-36 ejection seats - same as Su-33 kit. 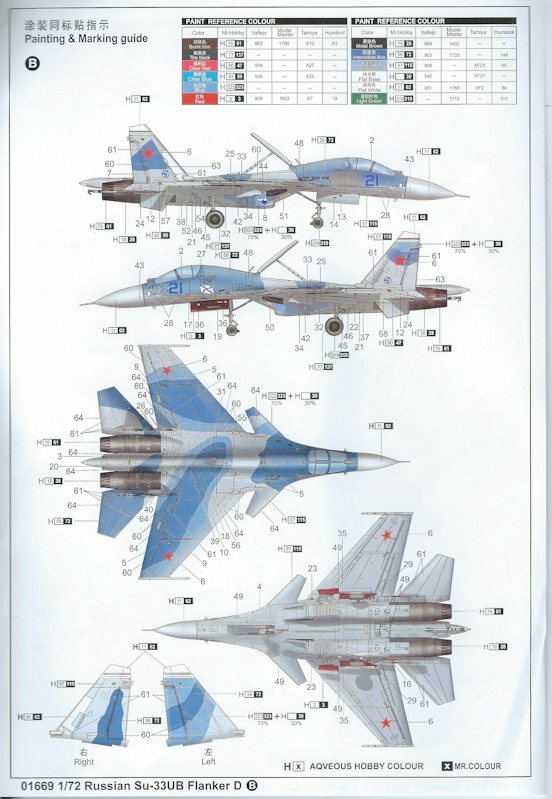 .... this one includes the exhibition number 717 see in August 2001. 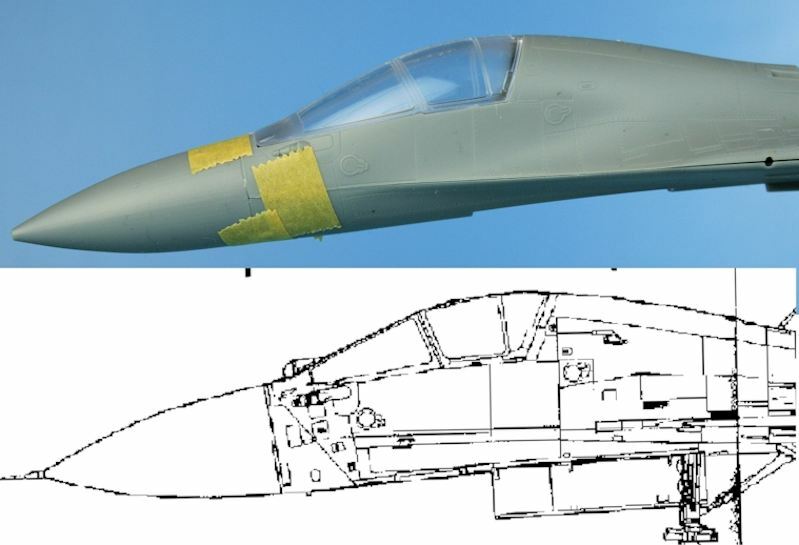 Cockpit and radome compared with AiV drawing. 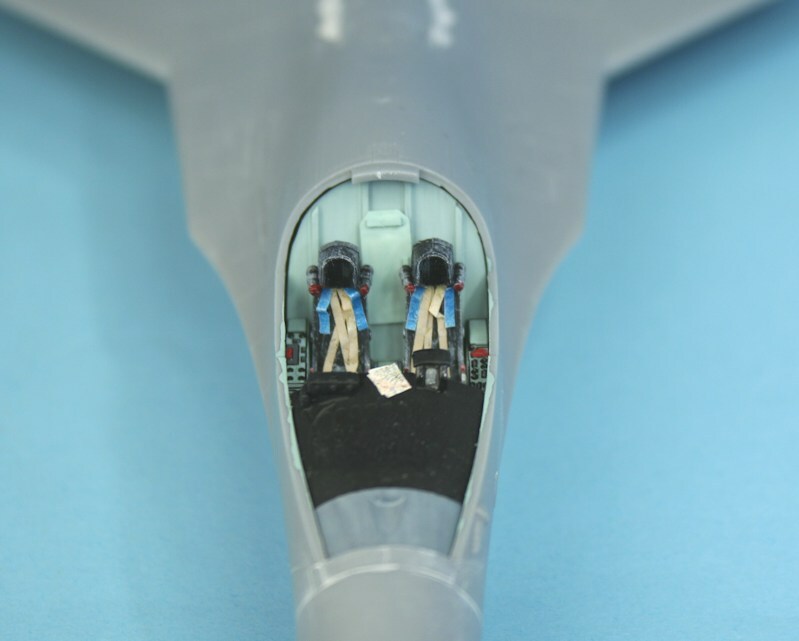 Perfectly adequate for a closed canopy. 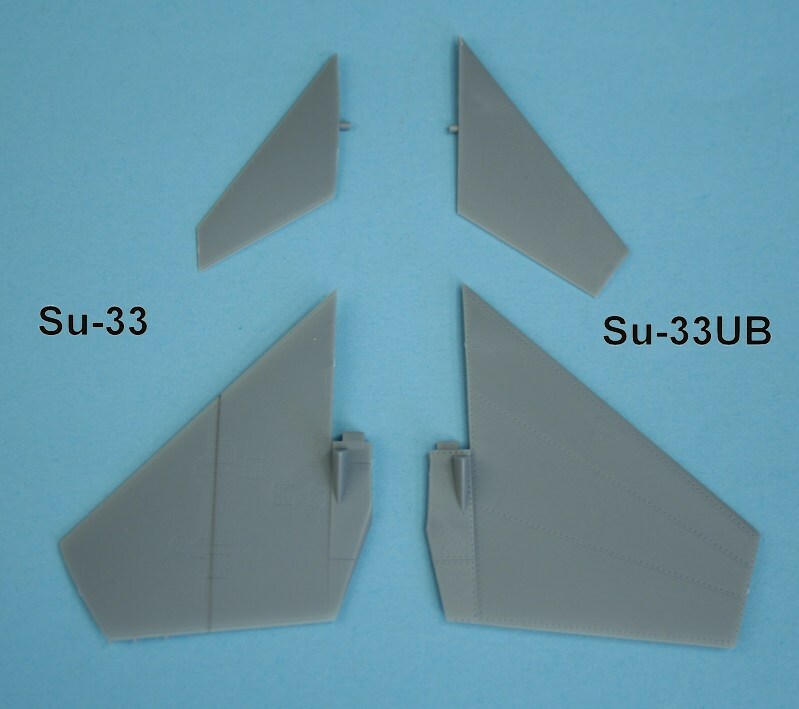 Side-by-side comparison - Su-33UB (left) and Su-33 - note the wing fold further outboard on the Su-33UB. 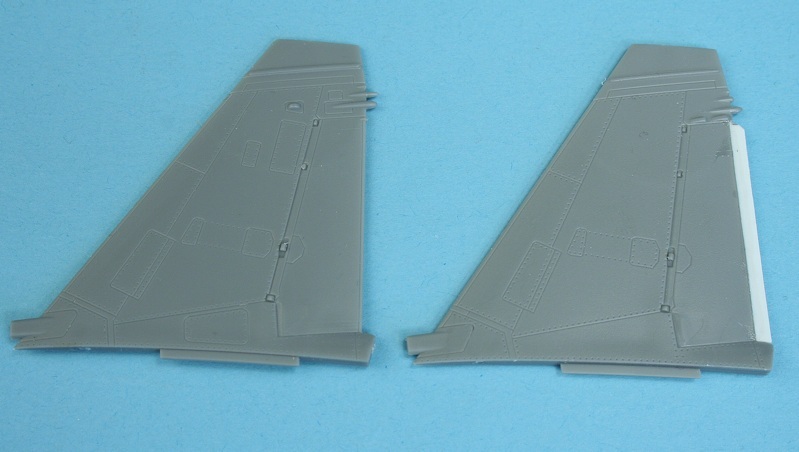 Trumpeter provide an 'unfolded' outer wing panel (left) - and a 'folded' panel with drooped flaperon (right). 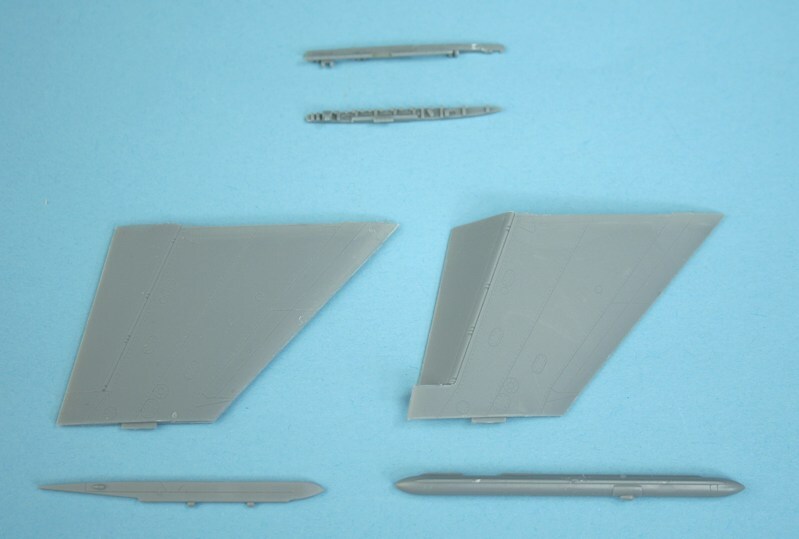 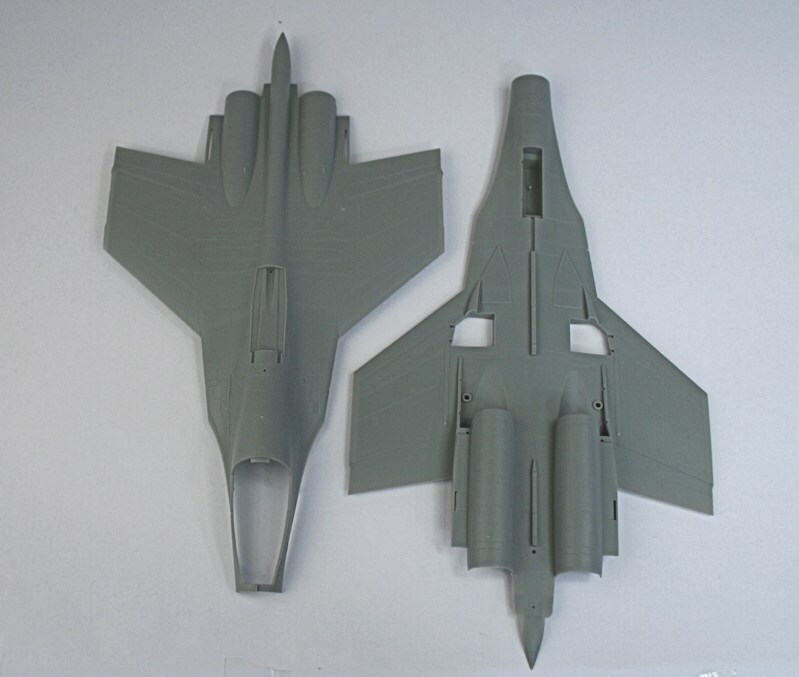 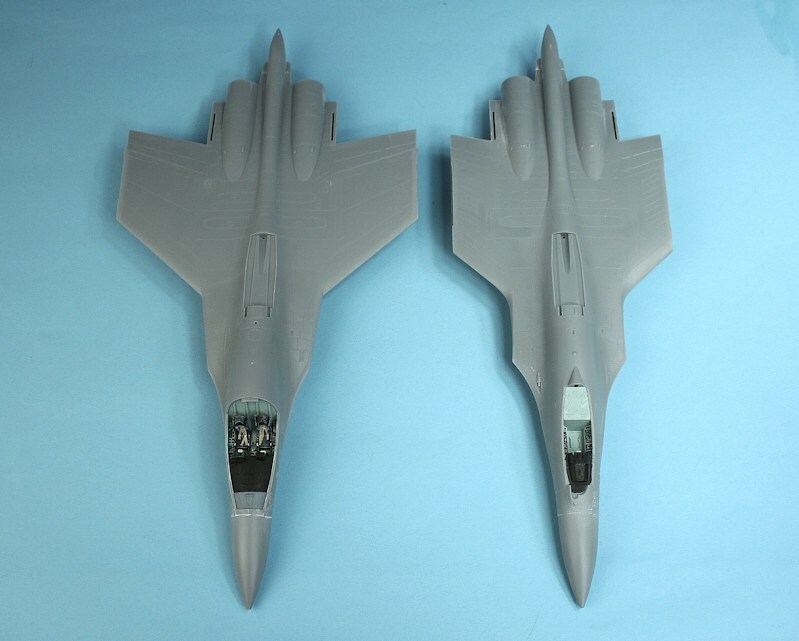 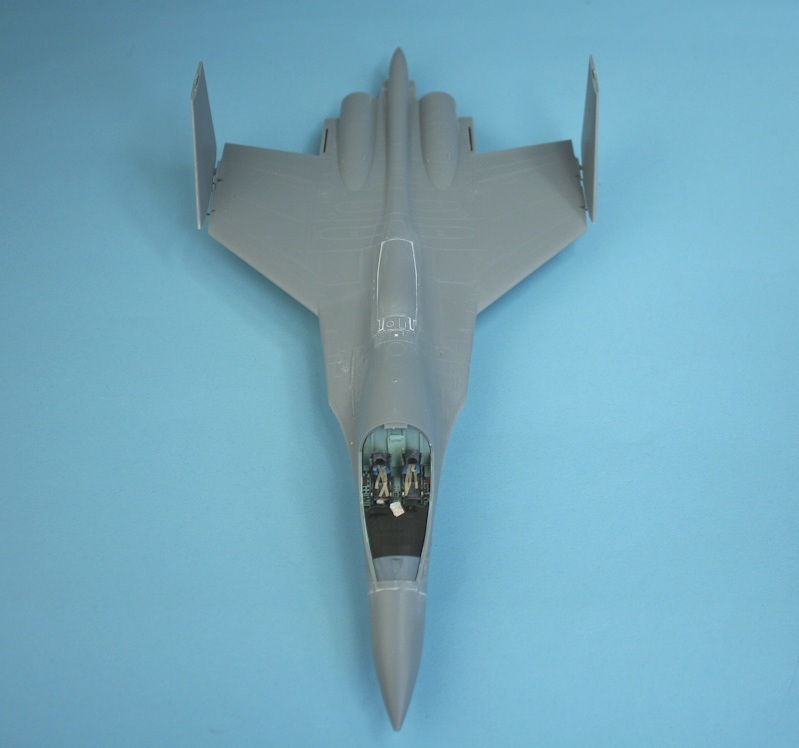 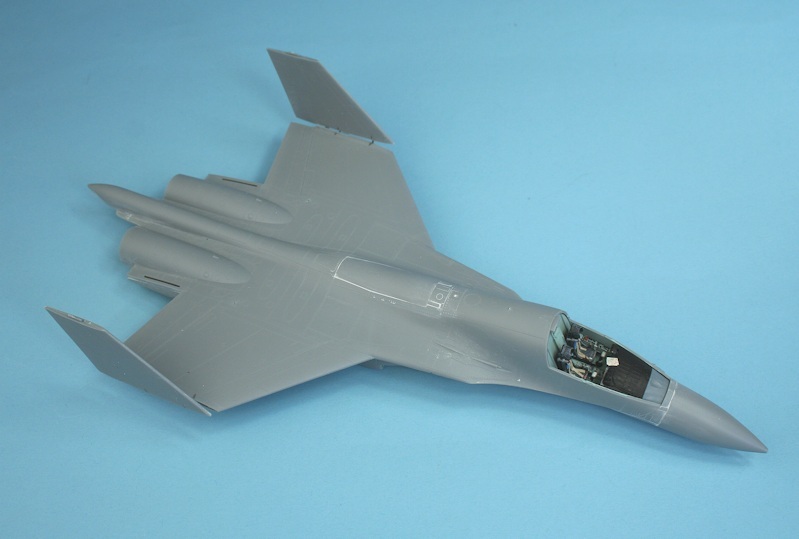 They also include a wingtip launch rail (L) and a 'Sorbtsya' ESM pod (R) - the detailed wing fold inserts are at top. 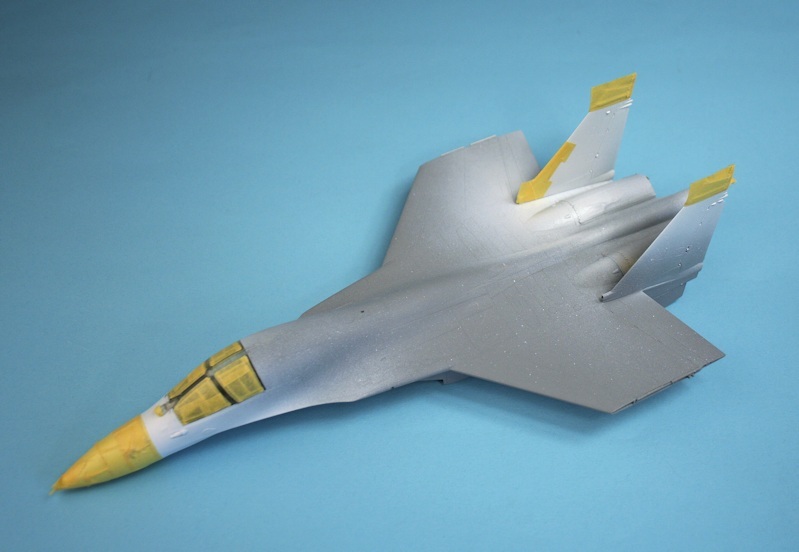 Contrary to Trumpeter's instructions, I'm make my wing folded panels vertical - with brass rod inserted for strength. 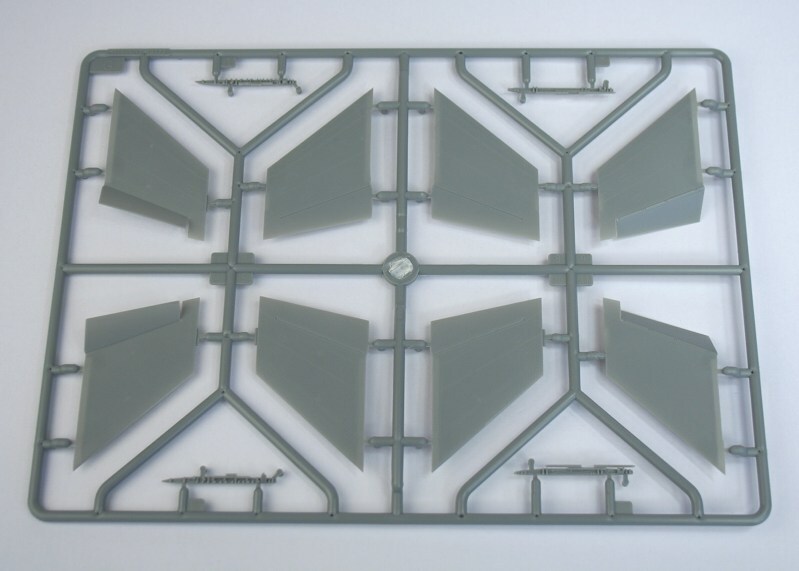 This is how I think the wing fold is on the real thing - using the panels with the un-drooped flaperons. 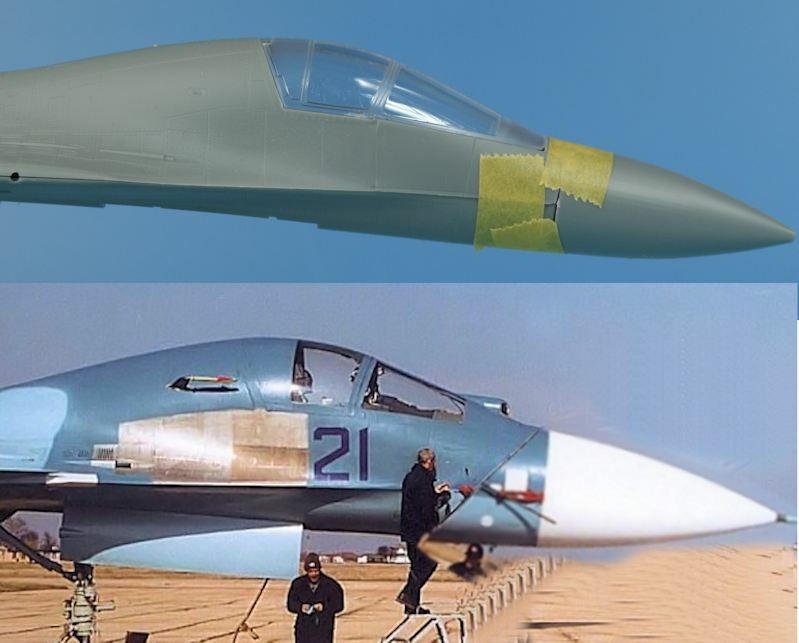 Bigger, non-folding stabilator and canards on Su-33UB. 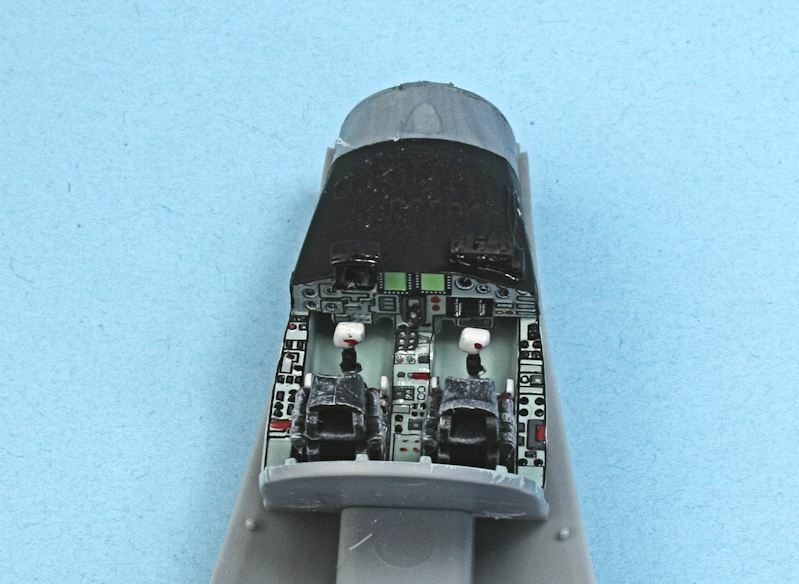 All masked up ready to paint. 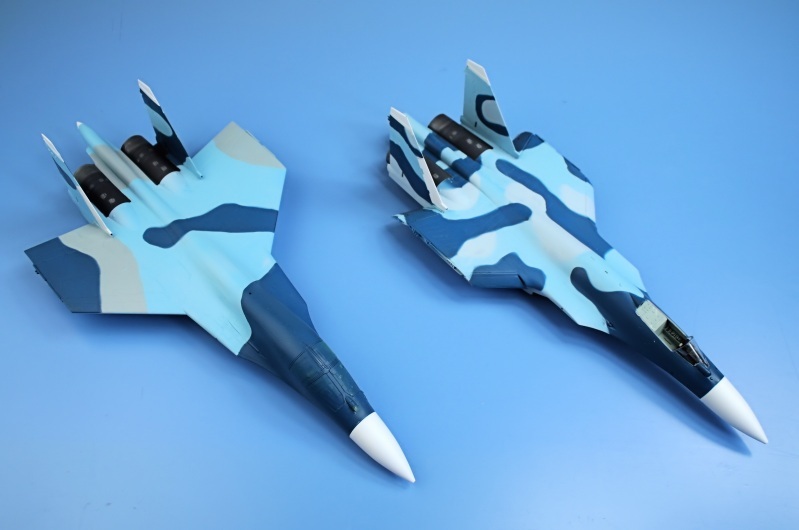 Su-33UB left, Su-33 right - I'm not happy with the colours - and the edges are too sharp! 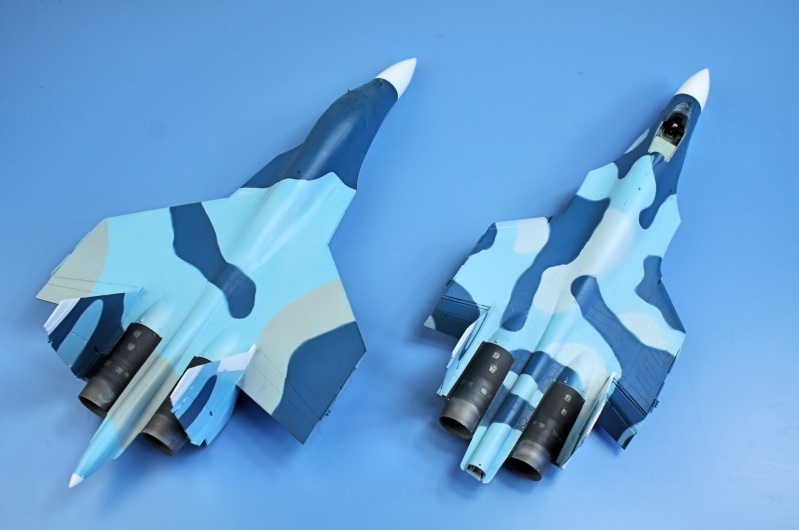 They need to be re-painted.